Friday: 11 a.m., 1 p.m.
Saturday & Sunday: 1 p.m., 3 p.m. 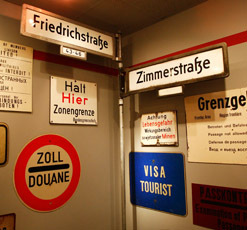 The Wende Museum offers school tours on Wednesdays and Thursdays. Please fill out the a School Group Tour Request to submit your visit request. Tours include the two current exhibitions and usually last around 60 minutes. Admission is free. The Wende Museum offers private docent or curator-led tours for a fee, subject to availability. Please complete a Private Tour Request form to submit your visit request and receive more information. The Wende Museum is located in Culver City’s arts and culture corridor near the intersection of Culver Blvd. and Overland Ave. Find detailed directions via Google Maps. Public transit directions are best found via Metro, Culver City bus lines, and Santa Monica bus lines. To reach the Museum via bicycle from the Culver City Expo Line stop, use Google Maps. Free parking is available in the city lots adjacent to the museum. You are welcome to take personal photography and video in all galleries and other public areas. Any exceptions will be noted with on-site signage. However, flash photography is not permitted in the galleries. The Wende Museum regularly records and photographs visitors for non-commercial educational and documentary purposes. By entering the property, you consent to the use of your appearance and likeness in any and all media without limitation or reservation. The Wende Museum is a smoke-free environment. Service dogs — that is, dogs trained to do work or perform tasks for the benefit of an individual with a disability, including a physical, sensory, psychiatric, intellectual, or other mental disability — are welcome at the Wende Museum. Service dogs should be dressed as service animals, and must be on leash, remain on the ground, and be under the constant control and supervision of the handler. Service dogs must be housebroken. Cleaning up and disposing of liquid or solid waste is the sole responsibility of the service dog’s handler, and the museum suggests bringing necessary supplies and addressing this issue before entering the museum’s property. A service dog and its handler will be asked to leave if at any time the dog is out of control or deposits waste on museum property. The Wende Museum is committed to making its collections, building, programs, and services accessible to all visitors, and understands universal accessibility as an ongoing process. Please check back for updates as we continue to expand access. For accessibility questions or assistance, please email info@wendemuseum.org. The front entrance of the museum is wheelchair- and stroller-accessible. Both public and emergency exits in the rear of the building are also wheelchair- and stroller-accessible. Multiple accessible parking spaces are available in the public parking lot immediately adjacent to the museum. All galleries, offices, workspaces, and outdoor facilities are wheelchair-accessible. There are two single-stall all-gender restrooms at the rear of the museum, as well as a multi-stall women’s restroom and a multi-stall men’s restroom near the front entrance. All restrooms are wheelchair-accessible. Seating is available in all public galleries as well as the museum gardens. All galleries and facilities are stroller-accessible. You are welcome to bring your stroller into museum galleries; however, the museum requests that you carefully navigate the galleries. Breastfeeding and bottle-feeding are permitted throughout the museum. Both multi-stall bathrooms near the front exit feature a large counter that could be used for changing. We encourage well-behaved children of all ages to visit the Wende Museum; however, those under age 11 must be accompanied by an adult. Development of audio tours and large-print gallery guides are in progress. We aim to achieve improved visual access before the end of 2018. ASL interpreters are present for select museum programs and can be requested. Please email info@wendemuseum.org for further information or to submit requests relating to specific events and activities.